We deal in an assorted range of CPVC Pipes in the national as well as international markets. The Cpvc Plumbing Pipes manufactured by us are accessible in various ranges, sizes, lengths, dimension, etc as per the requirement of the clients. They are used in various engineering and mechanical applications. Our CPVC pipes are accessible in different finishes and dimensions as well. 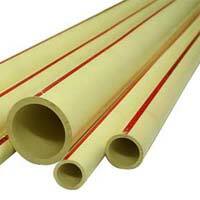 In addition to this, we are recognized as one of the prominent Flowguard Cpvc Pipes Manufacturers in India.